Nice, they’re done renovating the fountain at Washington Harbour. 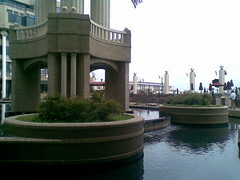 The planter islands are nice. Too bad it was all orange cones and caution tape for our wedding reception, at Tony and Joe’s, in Washington Harbour. But it looks nice now!